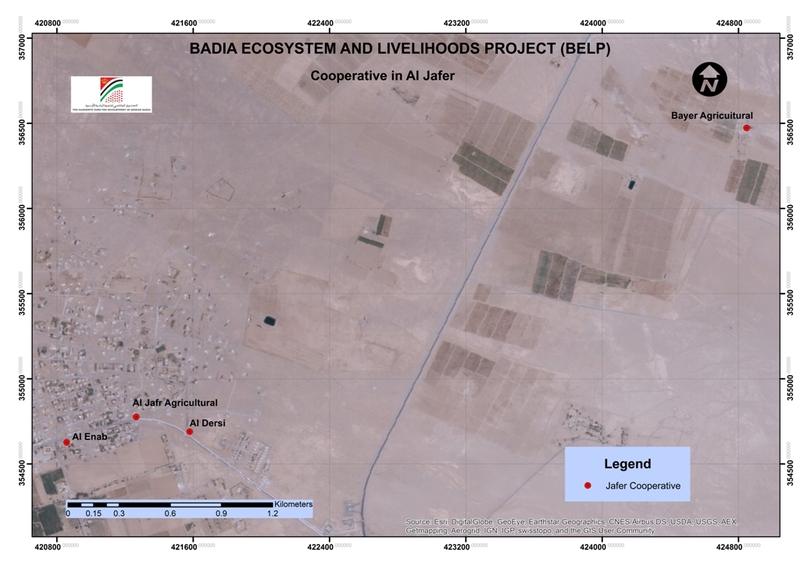 The Hashemite Fund for the Development of the Jordan Badia (HFDJB) is executing community-based activities funded by the GEF/World Bank-funded Badia Ecosystem and Livelihoods Project (BELP). 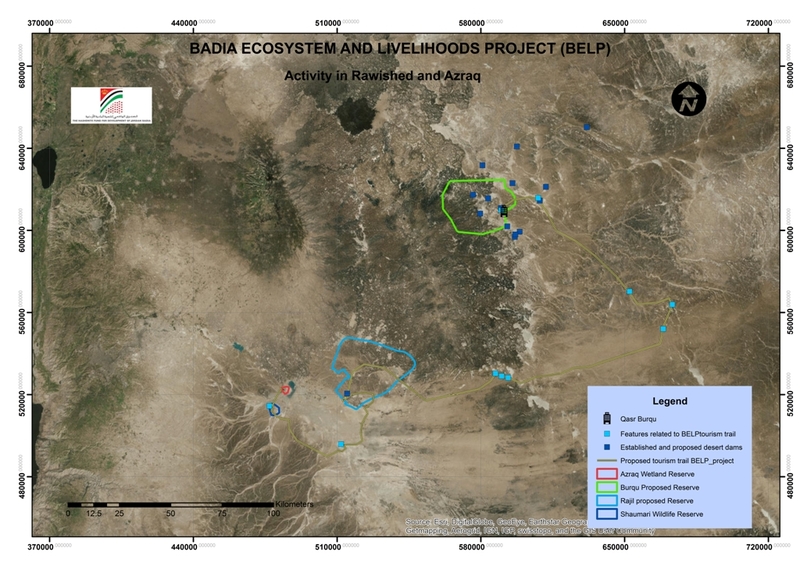 The Project Development Objective (PDO) is to support sustainable livelihoods and enhance ecosystem services through participatory approaches in selected areas of the Jordan Badia. The project will focus on three "poverty pockets"—two in the southern Badia and one in the northern Badia: Al Jafr and Al Husseinieh in the south, and Ar Ruwaished in the north. The National Center for Agricultural Research and Extension (NCARE) is the project Implementing Agency. The HFDJB and the Royal Society for the Conservation of Nature (RSCN) are the project executing entities. The BELP will be implemented over four years, from January 2013 to January 2017. Hectares of rangelands managed by communities in a sustainable, biodiversity-friendly manner in Al Jafr and Al Husseinieh sub-districts. The Project will establish a 250 km ecotourism corridor from west to east connecting the Al Azraq and Shaumari reserves managed by the RSCN, with the proposed Protected Area (PA) of Burqu', also to be managed by RSCN. 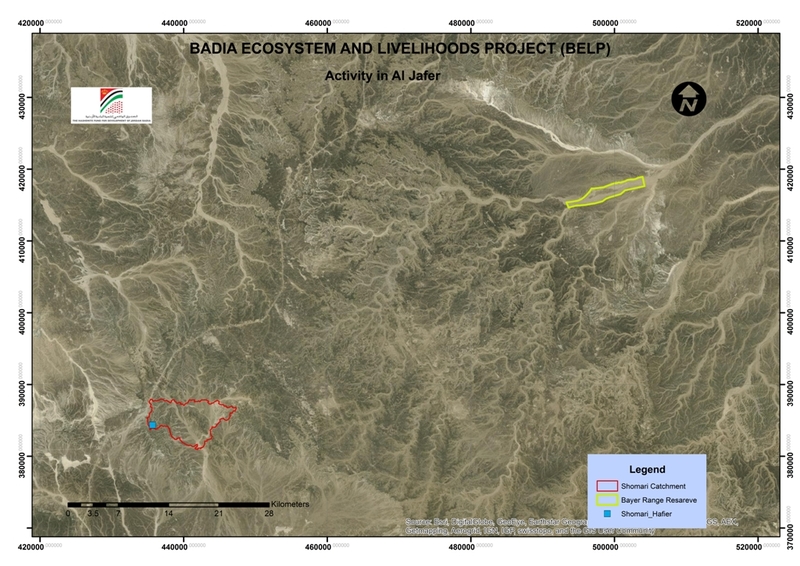 The corridor will be developed around a concept of low-volume, high-value, community-centered ecotourism, and provide income-generating opportunities to the Ar Ruwaished sub-district and nearby communities in the northern Badia, while contributing to the conservation of the area's biodiversity. The design, implementation, and management of the corridor will be determined in close consultation with concerned communities and laid out in an Ecotourism Development Plan (ETDP), which will include a mechanism for revenue sharing with the communities. It is expected that an ecolodge (10-12 room occupancy) and 1-3 campsites will be established along the corridor at sites determined by the ETDP. 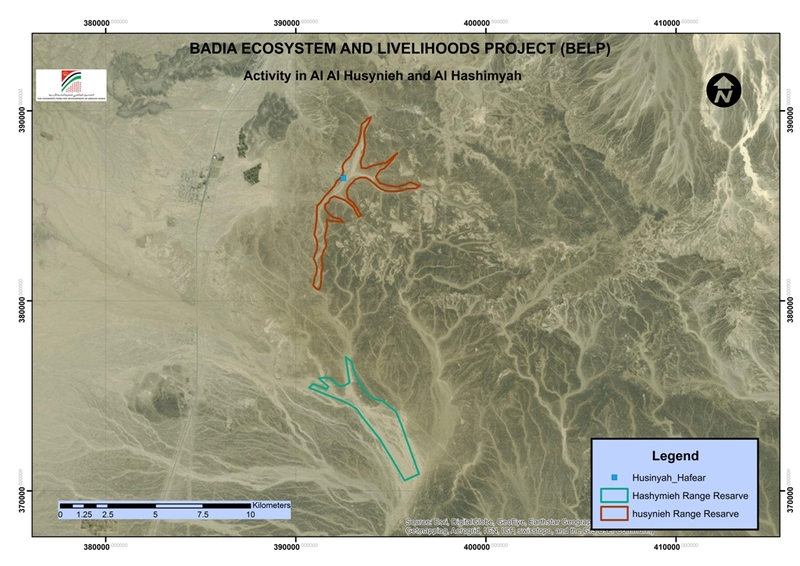 In order to sustain and support the livelihoods of local communities, the project will finance the establishment of two improved (in terms of design compared to current practice) and strategically sited hafirs, establishment and/or rehabilitation of two community-based rangeland reserves, and capacity building and support for alternative livelihood activities. Rangeland management systems options will be fully discussed with the communities through a continuing consultative process. A Project Management Unit (PMU), comprising a Project Manager, an M&E Specialist, a Financial Officer and a Procurement Specialist, capable of directing and supporting project implementation, has been established at NCARE. A meeting was held on January 8th, 2014 with Administrative Governors of both Al Husseinieh and Al Jafr, where it was agreed to hold a meeting within two week with general community members and focus groups to explain the objectives and activities of the project with coordination with the PMU and NCARE. HFDJB started compiling and preparing a list of proposed cooperatives which will receive grants from the project and the HFDJB. In addition, and the HFDJB has started preparing for a socio-economic survey, which requires a Rapid Rural Appraisal (RRA) of the target communities in order to gather information on their lifestyles, employment and income earning options, tribal affiliations, local decision-making structures and poverty incidence. The group talked about the successes and failures of past water harvesting projects implemented in their region. The main reason for the failures of a previously implemented hafir was the erroneous selection of the site. The group proposed some sites for establishing rangeland reserves, which are located on Treasury land, such as Wadi abu Amood, Bayer, Alshomare and Kzymah. The group mentioned that it was forming a consultative committee from the participants to represent the local community. In the end of meeting it was agreed that the consultative committee would provide the HFDJB with the names of the proposed sites for the hafir and rangeland reserves, through Al Jafr's governor. It was agreed to hold the next meeting after providing the HFDJB with the list of proposed sites. A women focus group meeting was held in the southern Badia on Tuesday, January 25th, 2014 at the Al Jafr Youth Center. The group consisted of 39 woman, who met with HFDJB's K-Experts, Dr .Maram Feryhat and Abd Allah Al Sardi, who have been tasked to assess the socio-economic circumstances of the target communities for the three sub components 2.1, 2.2 and2.3. This will guide community engagement efforts and support to be provided under the Alternative Livelihoods and Small Grants activities. The group talked about the successes and failures of past rangeland reserves projects implemented in their region, especially the Alqatf project. The main reason for the failures of previously implemented reserves was the erroneous selection of sites and inappropriate follow up. The group proposed some sites for establishing rangeland reserves, which are located on Treasury lands, such as Al Hashmyah and Al- Husseinieh. The group mentioned that it was looking forward to form a consultative committee from the participants to represent the local community, similar to the Al Jafr consultative committee. In the end of meeting, it was agreed that the consultative committee will provide the HFDJB with the proposed sites for the hafir and rangeland reserves through the Al Husseinieh governor. It was agreed to hold the next meeting after providing HFDJB with the list of proposed sites. A meeting was held on Tuesday, February 11th, 2014 with a World Bank mission in the HFDJB offices, at the presence of HH Sharifa Zien Al Sharaf Bint Nasser, preceded by a meeting with local community leaders from the southern Badia and PMU staff beside the project's K-Experts. HH Sharifa Zien insisted on the need to speed up the implementation of the activities of the project. Dr. Raad, HFDJB Director, presented a presentation about the project components, goals, activities and achievements. Some participants disagreed with some project activities, especially reserves and hafirs, due to the erroneous selection of sites and improper follow up of previous projects (by the Ministry of Agriculture). Some participants had reservations about the budget allocation of this project, especially the portion of the HFDJB. Some participants fully agreed with the project and suggested to increase its budget. The World Bank team discussed with the participants sub components 2.1, 2.2 and 2.3, and arrangements for the upcoming steps. A field visit to the proposed reserves and hafirs sites in Al Jafr was held on Thursday, February 13th, 2014 in the presence of HFDJB's K-Experts, Dr .Saad and Eng. Khaled with community members (Head of the community committee). The team visited two reserves and hafir sites: Al Kdyrat and Al Shomare. Afield visit to the proposed reserve and hafirs sites in Al- Jafr was held on Saturday, February 21st, 2014 in the presence of HFDJB's K-Experts, Dr Saad and Eng. Khaled, with community members (Head of the community committee). The team visited two reserves and hafir sites in Bayer. A men focus group meeting was held in the southern Badia on Tuesday, March 2nd, 2014 at the Al Jafr Youth Center. The group consisted of 9 men, who met withHFDJB's K-Experts, Dr. Maram Feryhat, Abd Allah Al Sardi and Ghanem, who have been tasked to assess the socio-economic circumstances of the target communities for the three sub component 2.1, 2.2 and 2.3). This will guide community engagement efforts and support to be provided under the Alternative Livelihoods and Small Grants activities. A men focus group meeting was held in the southern Badia on Tuesday, March 2nd, 2014 at the Al Jafr Youth Center. The group consisted of 9 men, who met with HFDJB's K-Experts, Dr. Maram Feryhat, Abd Allah Al Sardi and Ghanem, who have been tasked to assess the socio-economic circumstances of the target communities for the three sub component 2.1, 2.2 and 2.3). This will guide community engagement efforts and support to be provided under the Alternative Livelihoods and Small Grants activities. ✓ H.F. completed the preparations for the socio-economic studies, in addition to two assessment reports based on community consultation in both regions. ✓ A site has been selected for each of the three reserves in Al Husseinieh, Al Hashmyah, Al Jafr. ✓ A site has been selected for each of the two hafirs in Al Husseinieh and Al Jafr. ✓ HFDJB signed the grazing agreement with the representatives from the local communities in both regions in the presence of the local governor of the Maan district. ✓ Three awareness campaigns for range land and water harvesting techniques were held in Al Husseinieh, Al Hashmyah, and Al Jafr respectively. ✓ Based on the results of the socio-economic study, and the two focus groups that were conducted in Al Husseinieh and Al Jafr on July 16th and 17th, the training needs of the cooperatives were identified, and the training program to develop the building capacity of cooperatives was held. This training program focused on the first three priorities; while the rest of priorities will be included in further training programs that will be developed after the outcomes of the current training program are evaluated. ✓ A 30-hour training course was held between August 24th-28th in Al Husseinieh to build the capacity of cooperatives. ✓ A 30-hour training course was held between August 31st and September 4th in Al Jafr to build the capacity of cooperatives. ✓ At the end of session, the Director of Hashemite Fund distributed certificates to all of the participants. “Range School” equips badia residents with skills to manage grazing lands. Eight residents of Southern Badia graduated from “Range School” on Tuesday after gaining the skills and knowledge required to manage grazing lands in their area. Sharifa Zein Alsharaf Bint Nasser, chairperson of the Hashemite Fund for Badia Development (HFBD) board of trustees attended the graduation ceremony of the virtual school's first class. The school, "the first of its kind in Jordan", targets all members of the Badia community, including women and young people, to create a generation aware of its natural resources that must be preserved and developed to benefit generations that follow, according to Sharifa Zein. A "simple and scientific curriculum" is designed to enable graduates to become pioneers in their communities in managing rangelands in the badia, with the training course combining traditional knowledge and the science of rangeland management. The Range School is part of the Ecological Systems and Welfare Project in Southern Badia which started in 2013 and will continue to 2017. The fund is implementing the project in cooperation with the National Centre for Agricultural Research and Extension (NCARE) and with the support of the World Bank.